Ahhh, sugar. When I think back to to my teenage years, it is amazing to me how I am still alive. I ate sugar – pure sugar – like bodybuilders eat protein. From the age of 14, I had a wedding cake business for several years, and the amount of royal icing that ended up in my mouth was staggering; then there were all the pastry, chocolate, and sugar classes at The National Bakery School. I loved sugar. The sweeter the better as far as I was concerned. It is a total wonder to me how I was not diabetic by the time I was 20. Or how I weighed only 110 lbs soaking wet. Our bodies are amazing in their ability to protect us from the horrors that we force upon them. If I ate now like I did back in my teens, I would be the size of a house, and at the very least pre-diabetic. No more royal icing and meringue by the spoonful for me. Or so I thought. I give you, Sugar-free Meringue Cookies. 2 weeks ago I started playing with sugar-free meringue. I blame the Lemon Meringue Pie Ice Cream I was creating. You can hardly have Lemon Meringue Pie Ice Cream without any meringue now can you. To me, this is like the ultimate giving-the-finger to sugar. Oh my. Did I really just type that out loud? But really, it’s true. 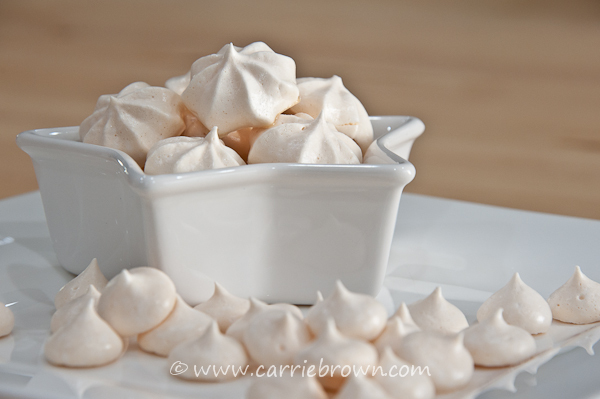 What is meringue except a bit of egg white holding a whole ton of sugar in suspension? Luckily for us, xylitol works much the same way as sugar does in this instance, although I found it to be a little finicky about the weather, and apt to color up a lot quicker; which is *really* weird since xylitol doesn’t caramelize like sugar. Anyway, it’s nothing we happy and healthy sugar-free cooks can’t work around. I must admit, it still feels incredibly naughty eating sugar-free meringue cookies, even though it isn’t. The first batch I made were so staggeringly sweet I almost couldn’t eat them, so in later trials I reduced the amount of xylitol in the recipe. If your sweet tooth has been gradually disappearing as a result of a sugar-free lifestyle then you likely won’t be able to eat many of these at one go, and you’ll want to eat them with something else to take the edge off the sweetness. 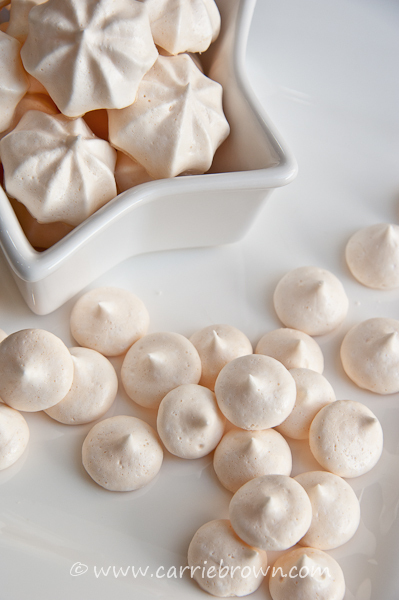 I’d save these Sugar-free Meringue Cookies for high days and holidays, dinner parties, birthdays, and other special events. Those times when I have guests over and I’d like them to feel “normal” – not like they are being force-fed healthy. In fact, the next recipe winging it’s way to you is a perfect summer dessert for just such an occasion. 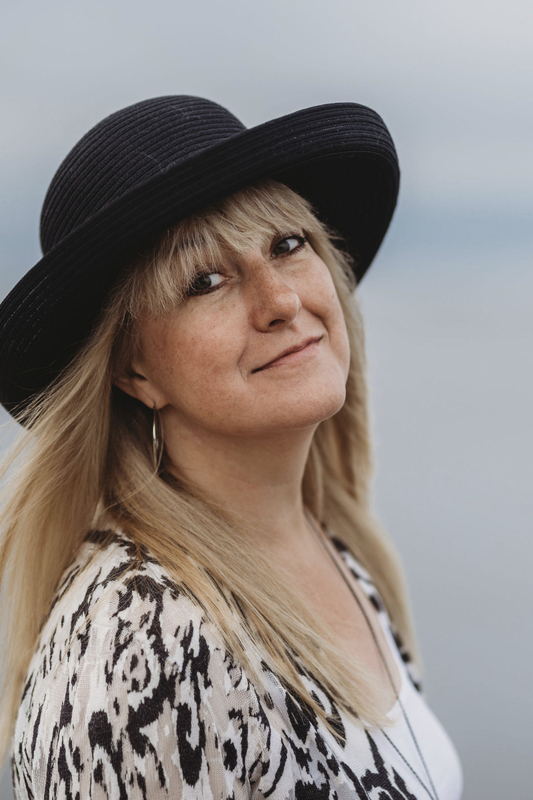 How fabulous to know that you can serve up something so fun and seemingly naughty without compromising your health or making your guests feel deprived. Let me just throw in one very important word if you are planning on making sugar-free meringue cookies: P A T I E N C E.
These sweet little babies take forever to dry out. I blame the xylitol. Anyway, you will get perfect meringue…eventually. Having followed the baking instructions in the recipe, if you remove them from the oven and they are still sticky (you’ll know because they will look shiny), just either leave them in the now-cold oven if you are not using it, or pull them out of the oven and leave them on the counter until they are dry. The final batch that I made (pictured) were not fully dry for 2 days. I am telling you this so that you can plan, and so that you are not disappointed or frustrated when they are not ready after following the recipe. They will be ready…eventually. What’s weird is that leaving them in a heated oven for longer than the recipe did not dry them out any faster. I can’t explain it, it just is what it is. Also, baking them at a higher temperature does not speed up the drying time, it just makes them color. Xylitol colors faster than meringues made with sugar, so don’t turn the heat up unless you want dingy-looking meringues. You have been warned. I would plan to make these at least 3 days before you need them. Once they are dry they will store for a week or more in an air-tight container, so I recommend making them in advance and storing, rather then risking them not being dry in time. Out of this batch I used the little stars for making Eton Mess, and used the buttons in Lemon Meringue Pie Ice Cream (Get the recipe in my Ice Cream Book – it is SOOOOO good! ), but you can pipe them in whatever shape you fancy, depending on what you want to use them for. You’ll want a pastry bag like these – the larger the better, and some nozzles or tips like these. Place the egg whites in a large mixing bowl, add the lemon juice and whisk using either a stand- or hand-mixer until the egg whites have formed stiff, dry peaks. Add the xylitol, a tablespoon at a time, whisking very well between each addition. Once you have added the last of the xylitol, continue whisking until the meringue is stiff and very glossy. Using a piping bag with the nozzle of your choice, fill the bag with meringue and pipe small shapes onto a baking tray lined with parchment paper. Place the baking sheet(s) in the center of the pre-heated oven and bake for 2 hours. 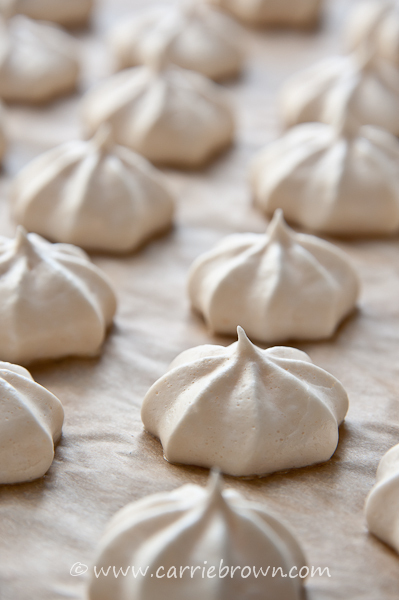 After 2 hours, turn the oven off and leave the meringues in the warm oven overnight. If the meringues are still sticky in the morning, leave them in the oven until they are dry, or if you need the oven, place them somewhere dry until they are ready. This could take up to 2 days. Patience is a virtue. More general information on ingredients. Thanks for all your SANE recipes. I’m personally a bit hesitant against all processed foods and I try to avoid sugar instead of replacing it with some other sweet ingredient. This does not mean I do not eat sugary stuff. Since I’m following a Paleo/Primal lifestyle I cut back to premium dark chocolate (I’m Swiss and live in a country of Chocolate :-) which I enjoy in very small portions every day. 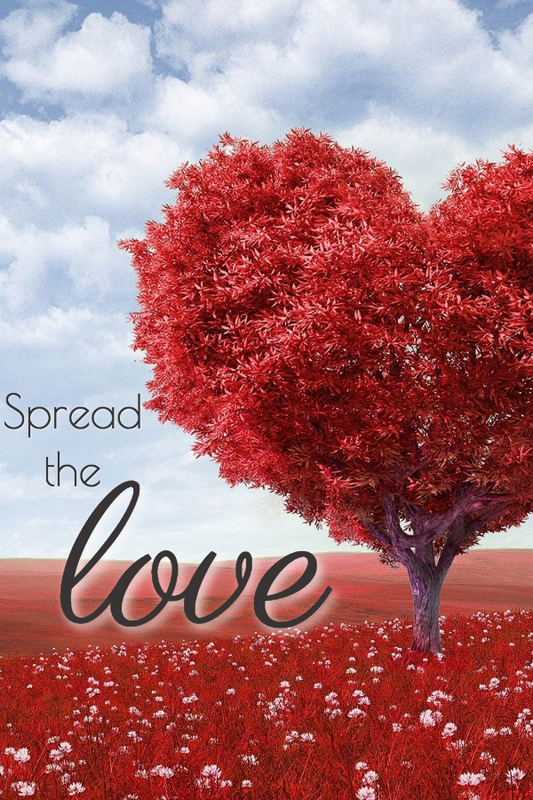 I bake for my son and husband with Xylitol. They prefer the taste to Stevia which they do not like. Now my question: did you get feedback that some persons get stomach pain from Xylitol? I personally do not like the textur and taste of the baked good in my mouthh and get uneasy in my stomach immediately after I ate Xylitol. Francesca - Thanks so much for this advice! I have thrown away FOUR batches of forgotten meringue cookies now. I will,try again today, and let you know how long they took to dry out. Wish me luck! Francesca Carey - Yes, not drying out! We live in Hawaii, so that might be part of the problem, but darn it, I REALLY want to make these cookies!! The recipe is for 2 egg whites, 1/4t Cream of Tartar, 1/2 C Xyla, 1 tsp Vanilla and 1 C pecans. You fold the pecans and the vanilla into the stiff egg whites, and bake with the Overnight Method, start at 375º, shut off oven, leave overnight. (This is why they are called Forgotten Cookies!) However, they were wet and sticky in the morning. I thought that I had not whipped them enough, so I did batch #2, really stiff, and tried the Overnight method again. No good. #3 I tried baking them at 200º for two hours. They were still sticky, BUT I left them in the oven because we were having a dinner party. The next day when I was throwing them out I found that ONE of the cookies had baked, but I did not know why!! It was delicious! So – this is batch #5 in the oven right now – will then leave overnight, and see what happens over the next two days. I only hope the ants don’t find them!! thanks so much for answering me so quickly.